If you ever need to look under the Windows hood, heaven forbid, head for the desktop’s Control Panel by right-clicking your screen’s Start button and choosing Control Panel from the pop-up menu. Clicking the System icon brings up technical information about your PC. Windows Edition: Windows comes in several versions. In this section, Windows lists the version that’s running on your particular computer. System: This area lists your PC’s type of processor (its brains, so to speak) along with its amount of memory. 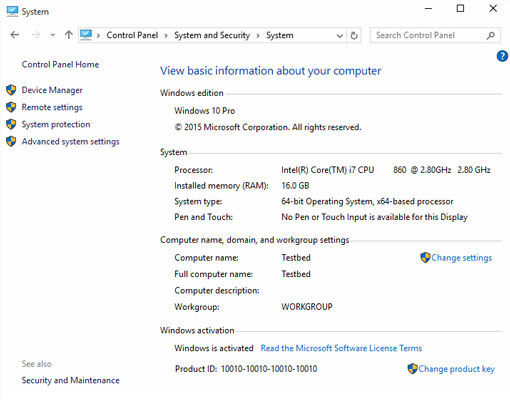 You can upgrade memory fairly easy on a PC or laptop but not on a tablet. Windows Activation: To keep people from buying one copy of Windows and installing it on several PCs, Microsoft requires Windows to be activated, a process that chains it to a single PC. System Protection: This option lets you create restore points. You can also come here and use a restore point to take your PC back to another point in time when it was in a better mood. Advanced System Settings: Professional techies spend lots of time in here. Everybody else ignores it. Most of the stuff listed in the System window is fairly complicated, so don’t mess with it unless you’re sure of what you’re doing or a technical support person tells you to change a specific setting.